There's no easier or more practical way to add spirit to you school than with Neff's custom school mats. Attractive, industrial strength custom school mats are durable and constructed with heavy traffic in mind. They come in a variety of shapes and sizes to fit your school entryways, gyms, libraries, auditoriums, locker rooms, faculty offices or coaches boxes. Choose from custom high-definition school mats which feature photo-realistic designs and digital prints that are more vivid, and nearly 10 times the resolution of previously available mats. High-definition mats also feature StainStopperTM to protect these colors, and can be customized and cut out for any shape or logo you'd like to feature. Designed to meet each state's rule requirements, check-in school mats provide a portable, long-lasting solution to defining the check-in area. Durable and easy to clean, check-in school mats are made to last and will look great year after year. Many of our school mats are made with 100% static dissipative nylon, which meet National Federation of High Schools guidelines and fire codes, and is safe to use around sensitive electronic equipment. 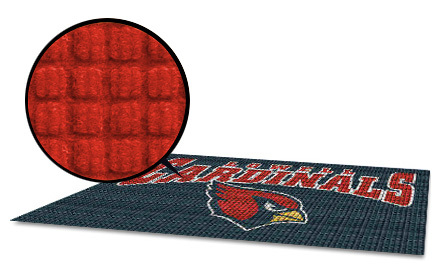 A heavy-duty rubber backing ensures that your school mats will stay in place. For more information on all of our school mats, take a look at our school mat catalog. All of our school mats come with a 3-year warranty. Your 100% satisfaction is our guarantee. What are you waiting for? Custom design your custom school mat today!